Belize is frequently called “Mother Nature’s best kept secret”, and for good reason. Being the best-kept secret can make finding out about things to do in Belize a chore. We’ve saved you the hassle of all the research and present you this guide on the best attractions and activities to see and do in Belize. Belize is host to a small army of limestone Cave systems, many of which were used by the Maya, the ancient denizens of this land, for what we believe today to be ritual sacrifices to the Gods of the underworld, “Xibalba”. Today quite a few are open to the public and intrepid explorers such as Actun Tunichil Muknal (ATM for short) in the Cayo District and Horeb Ha in Toledo. 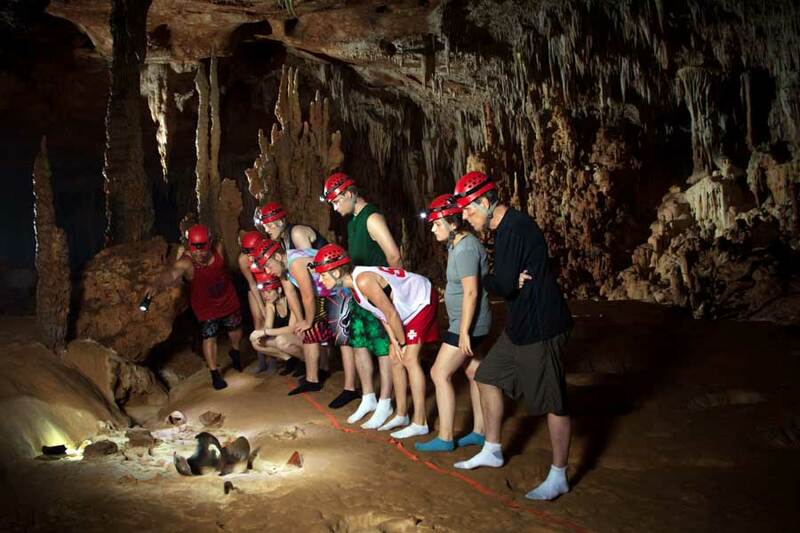 The ATM cave is a top item in any things to do in Belize list, and is a curiosity in and of itself. Though lead by a guide, it is still not for the faint of heart. That’s not to say there’s a frightening experience to be had there but a challenging one which should be reserved for the avid adventurers. The cave is punctuated by low ceilings, narrow waterways and high climbs that make it impossible to simply “go around”, but for those stalwart enough to make the trip the wonders held inside will hold an intriguing position on your memoirs forever. No two Cave tours are alike and so not all need to be stone-cold challenging. Water tubing through caves branch or paddling through Barton Creek Cave are also wonderful ways to discover Belize’s “ancient underworld” splendor while taking it easy at the same time. Barton Creek cave heavily contrasts the famous Aktun Tunichil Muknal, but should be held in as high regard in its own right. The cave entrance is rift-like, a wormhole into a museum of natural process which gives new meaning to “life mimicking art”. Emerging from the other end of this cave system is like being re-born into the light after floating through darkness. The guided canoe tour of Barton Creek takes you through almost two kilometers of dugout limestone formations bordered by overhangs that hold on to both the walls and the artifacts left there so long ago. There are narrow passages but Barton Creek cave sometimes opens up into Cathedral-sized rooms with ceilings towering high above your head harkening to gothic architecture with stalactites as columns. It’s the kind of experience only your mind will be able to justifiably picture thereafter. BONUS: The ATM Cave is also regarded as one of the top 10 sacred caves in the world by National Geographic. This little Central American/Caribbean country is lucky enough to boast the longest stretch of healthy coral reef this side of the world. 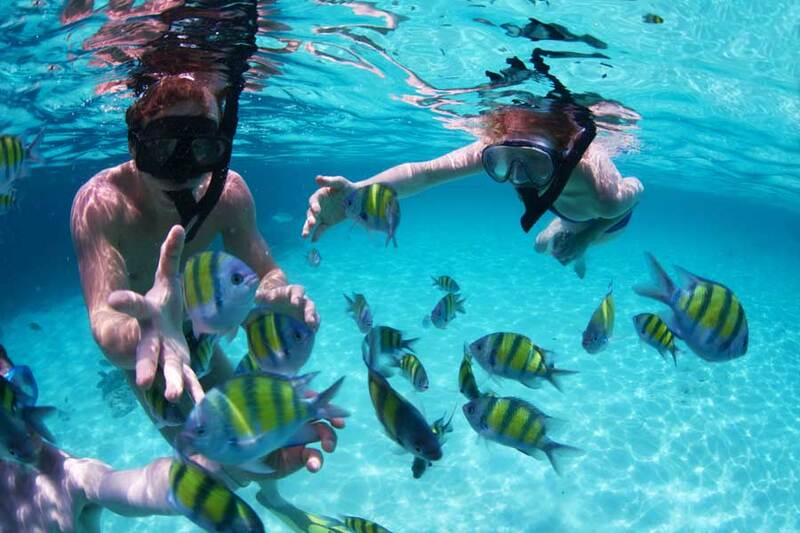 Belize supports a wealth of opportunities for diving and snorkeling. Hol Chan and Shark-Ray Alley are gorgeous areas for snorkeling near the reef and meeting all the inhabitants therein, you can even swim along with nurse sharks! Hol Chan, which is Mayan for Little Channel covers an area of about square 8 kilometers and is comprised of four zones, each denoting a distinct type of marine habitat. Zone D is Shark-ray Alley which is so-named because it is a playground for southern rays and nurse sharks. At the focal point of this reserve is a “quebrada”, a literal split in the reef which is about 23 meters in width and 9 meters in depth located in what is known as zone A. The Hol Chan area is a must see for any tour passing around the northern cayes, it provides a great opportunity to experience what aquatic life is like for Belize’s undersea residents. In shark ray alley the nurse sharks and rays will literally swim up to one giving the impression that they would like to be touched. It is advisable not to touch them, however. Near the reef all the local fishes swim by quickly minding their own time truly providing a look into what daily life is like for them. For those who are experienced in aquatic traversal, diving into the Great Blue Hole off the coast near the Lighthouse Atoll is a singularly awe-inspiring experience comparable only perhaps to swimming with the whale sharks as they pass us during their yearly migration. The great blue hole is a limestone sinkhole formation that began its life over 150,000 years ago above sea level, before the oceans rose to where they are today and has an estimated depth of 125 meters at its lowest point. This area is also home to many of Belize’s fish species, quite different from those in and around the reef giving divers a unique chance to experience a completely different habitat a stone’s throw away from the rest of the barrier reef. During the inception of summer; late May to early June, whale sharks, quite literally the largest fish in the sea make their way past the southern coast of Belize on their yearly migration north into the Atlantic. The whale sharks, like the nurse sharks are rather tolerant to divers, and even though their mouths are big enough to swallow us whole, they pose no threat due to the fact that they are filter feeders. Whale sharks eat krill and plankton that photosynthesize close to the water’s surface during the day. Chances to see these under-sea behemoths are rare. Divers have only a 2-4 week window to make it out to experience their “fly-by”. This is definitely one of those experiences you want to put on your Things to do while in Belize list! Exploring ancient Belize Mayan Ruins! With over 900 documented Maya sites it’s hard to get bored here, historically famous sites like Caracol, and Altun-Ha will dazzle you with their staircases stacking seemingly toward the sky and if you stay long enough you can witness the sunset from some of the still-tallest edifices in Belize. Caracol’s name came as a result of the winding road that archaeologists would have to take to get there, glyphs have been found depicting the rulers referring to themselves as the “Three Hills Lord” which indicates the name we gave it might not have been its original name. 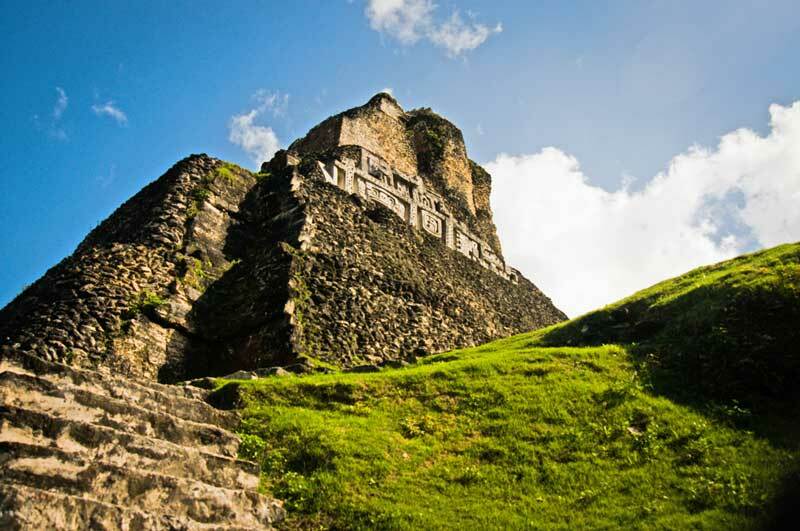 Caracol is famed for having been a rival of the great city of Tikal in Guatemala, it is quite literally a sky fortress perched atop a peak in the Maya Mountains of Belize and historical records note it as a great military presence in the region. Much of it remains un, or partially excavated given to the sheer density of structural presence in the area but there is still much to see and the main temple is an impressive monument, almost fourteen stories high. From the top it can be seen as a temple atop a temple due to the open plaza a ways up which leads to three distinct smaller temples crowning the entire edifice. Caracol is a great bird watching spot and as you’d imagine a great hiking experience. Xunantunich, meaning stone lady is another example of a temple name not being what the Maya gave it. The stone lady is an urban legend surrounding the area in which people claim the apparition of a woman clad in white with fire red eyes appears at night and ascends the stairs of “El Castillo” which happens to be the tallest temple on the grounds. Like many other maya sites in the area, Xunantunich is set on a hill and overlooks a very wide area of Belize, even some few miles into Guatemalan territory. It is interesting to note, what while not a site of particularly major importance in the Mayan era, El Castillo is the second tallest temple, second only to Caracol at 130 feet high, the vistas are gorgeous and exploring the cracks and corners of this site is one of the most interesting yet. Do remember, if you’ve been to a particular site before don’t be afraid to re-visit as there are always new digs opening up expanding existing plazas and discovering entirely new areas that haven’t seen the light of the sun or moon for centuries. GIVEAWAY: If you’re looking for Belize Mayan Ruins tours, get a 10% discount by using promo code #ChaaBlog16. Dubbed “the best little zoo in the world”, The Belize Zoo began as a result of a loving attempt to provide a home for animals that were used in documentary films about the local rainforests. The zoo provides visitors the best wildlife encounters. They house over 170 animals all native to Belize, and also endangered species like the jaguar, scarlet macaw, black howler monkey, and jaribu stork. Recent infrastructural developments have now made it the first fully accessible nature destination to visitors with physical disabilities. 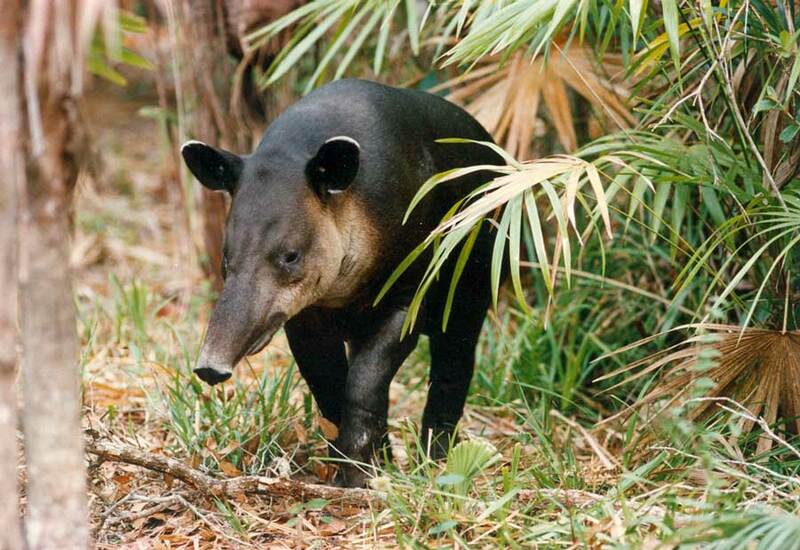 This is also the best place to get excellent photographs of Belize animals. This is also listed as one of the best things to do in with Kids in Belize. If you’ve had your fill of diving and snorkeling and wish there were something else to do, Belize still has you covered. The cayes offer a wide breadth of water sports such as parasailing, sail boarding, paddle boarding, banana boats, jet skis, and for the more sea savvy, there are also catamarans to be sailed. Beaches are fun when you’re building sand castles or getting covered in sand by your friends, but that is not all being offered on Belize’s islands. Along the beaches are dozens of hotels, equipment rentals and tour companies happy to give you a taste of what life is like out in the big blue. From San Pedro one can kayak or paddle board out to the reef for an up-close look, if you fancy a view from up high that lasts longer than your flight in then para-sailing is for you. Being strapped (safely) into a parachute and being pulled along the coast by a boat has to be one of the most liberating experiences, not to mention the birds eye view of practically everything going on around the island! If you prefer being the captain of your own voyages then maybe zipping just off the coast on a jet ski is for you, or better yet rent a catamaran and go as smoothly as you like, you can also actually call yourself captain then. The original island inhabitants of the islands were all fishermen and fishing tours are also readily available, both within the reef and for the daring anglers, beyond the for big catches. There’s not many things that compare to catching your first fish, or your hundredth fish and if you’ve not done any then that should be among the tops of your list. 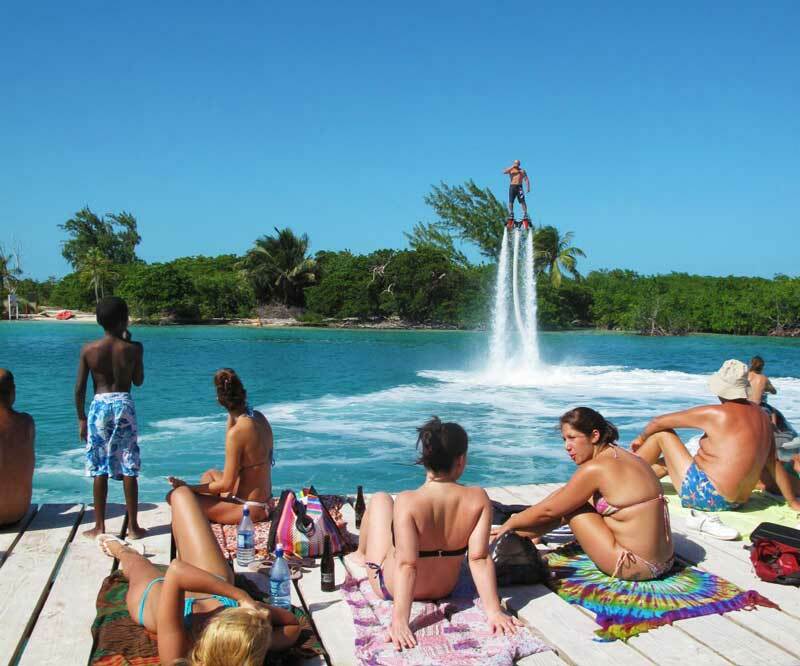 Mainland Belize is also filled with opportunity for water fun. With cave tubing, canoeing, pontoon tours and good old fashioned fresh water swimming to round out the roster. The Rio on Pools, and Big rock falls in the Mountain Pine Ridge area are perfect examples of naturally created granite formations worn and cut by running water. The springs that feed these gorgeous cascades provide some of the cleanest, freshest, coolest water that will delight anyone, especially on a hot day. Cayo and Stann Creek districts are situated in, around and atop the Maya Mountain Range that reaches its peaks in Belize making these areas for those who would like to head out and enjoy nature. Most famously, Victoria Peak in the cockscomb basin is a favorite for mountain climbers and is a grueling hike to the top with a satisfyingly magnificent view thereafter. Despite Victoria peak’s popularity the actual highest peak in Belize is Doyles delight. Though only slightly taller will provide just as much of a challenge to anyone who dares to try for the peak. As well, within Cockscomb Basin, the world’s only jaguar reserve, there are a wealth of jungle trails to traverse and explore with the added bonus of chance encounters with some of Belize’s most elusive species of animals. Much can be mentioned for hikers, The Mountain Pine Ridge range with its countless falls and rivers to explore, the Maya sites, you’ll be staying a while if you want to do it all! BONUS: For something more adventurous, check out our 4 Hard to Reach Destinations in Belize that are worth the Trek blog. For those of you who enjoy the rush of rustic life, being one with nature and generally roughing it then everywhere In Belize is an awesome place to set up a tent. Many properties include camping facilities, or the grounds to do so on. Think camping on a beach, or camping in the mountains where your only lights are the stars, or pitching a tent under the jungle canopy like the locals and explorers of old. There really are very few actual limits, and with that, so very many opportunities to become one with the flora and fauna that call this tropical paradise home. If all the excitement and adventure aren’t top in the itinerary Belize also has many relaxing things to do. “Go Slow” is even Caye Caulkers slogan, and is part of the general how-to in the jewel and the locals really know how to take it easy at the appointed time. Wish so much relaxed atmosphere around it’s virtually impossible not to be lulled by the chill Belizean Vibe. There are few better things to do in the Caribbean than being a beach bum. it may be a stereotype to lay in a launch chair on the beach with a piña colada under a large umbrella observing the surf but it’s one of the best proven ways to take a load off on the sands. If you want the beach chill, without the bum you may ask your hotel’s front desk for an exercise mat and unwind with yoga near the waves, it’s certainly the best of things to do in Belize for tranquility. Many Resorts in Belize are equipped with a spa or massage center. Spa treatments and massages are the pinnacle of pampering and relaxation, it’s near impossible to be tense after a Swedish massage! Treatments aren’t confined to only within Spa’s here either as may properties offer massages in scenic areas, such as a shady hilltop or even waterfront near the beach for the more adventurous still seeking to loosen up after a long trip. 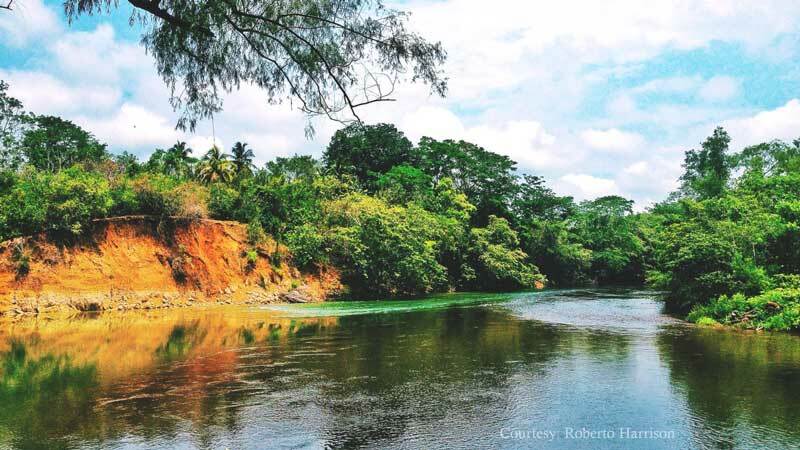 Mainland Belizeans Love the rivers, these life-giving aquifers have been supplying life and enjoyment since the time of the ancient Maya. Their role to locals hasn’t changed much since and one of our favorite things to do in Belize is definitely “chilling” in the river. Whether you want to float along in a tube filled with air or just lounge off on the river bank, or even enjoy a slow swing in a hammock overlooking it the calm meandering streams are sure to lull you into absolute bliss. It is difficult to list all the things to do in Belize all in one go, a country as diverse in both people and landscape such as this hides adventures and oddities in all corners. Our best advice is to go out and do as much as you can and not be afraid of spontaneous side tracks. Who knows, your unplanned diversion could become the next big thing! If we missed any things to do in Belize worthy to be placed in your books, please comment them below! We will update this blog accordingly :-).